Here is some Free Portfolio WordPress Themes for your websites. This is great collection of the 10 best portfolio WordPress themes specially for creative professionals, photographers, artists or anyone who would love to showcase their work in stunning way. All these are responsive and premium quality themes and fully loaded with advanced theme options. With these themes, you can build your own professional website with unique layout. We have selected best themes for you after reviewing hundreds of themes to save your time. Have a look at this outstanding collection of best portfolio themes. Aneeq builds Professional WordPress Themes, functional, showcasing a portfolio, or publishing a blog, responsive, free and premium, with everything you need to create wonderful websites. Aneeq is a completely clean and creative Multipurpose responsive WordPress theme perfect for bloggers, business, freelancer, corporate, Agency, Portfolio, consulting, travel, E-commerce (WooCommerce), wedding planners and Real Estate websites. The theme offers unlimited colors and box/wide layout option and unique blog layouts and WooCommerce storefront with a beautiful & professional design. Very fast, responsive, RTL & translation ready, best SEO practices, unique WooCommerce features to increase conversion and much more a lot. Check out also Premium version of Aneeq, because the premium version has a offers a lot more features. Aneeq WP theme made by A WP life. Check the demos to realize that it’s the only theme you will ever need. Neptune Portfolio is a unique & free WordPress theme that delivers amazing imagery for your blogs and personal portfolio sites, with a standard four column grid supported by masonry , you’ll always expect a perfect design no matter which device you are on, be it your iPhone, android phone or desktop. You can use Neptune portfolio to build your photography site, personal portfolio, agency portfolio or travel blog. Neptune Portfolio is already translated to Spanish, French & Portuguese and 100% translatable to any language WordPress already supports. An appealing portfolio can win you new business, so a theme to help present your work well is a must. With customizable branding options and an array of stylish layouts, Uncode may fit the bill. A theme designed to showcase your work would be nothing without a number of layout options, and Uncode delivers on all counts. There are over 16 portfolio and blog post layouts built-in (all with custom options), and over 70 ways to display content – including masonry, metro, and carousel layouts. Media is displayed within a lightbox provided by the bundled iLightBox plugin, and the LayerSlider and Revolution Slider plugins can prominently display any work you’re proud of. Page layouts are handled with the included Visual Composer plugin – this version being tailored to provide some streamlined layout options – and six menu styles, enabling you to create the right navigation to suit your site. There are also extensive font choices available from Google Fonts, Font Squirrel, Fontdeck, and Typekit. If you want to hit the ground running, the developers have provided over 30 demos to install, all with one-click import. Additionally, the developers have provided extensive online documentation and a set of narrated video tutorials, to give you a helping hand if needed. Overall, Uncode is a near-perfect theme for displaying your portfolio with style. Oshine is a clean and beautiful, multi-purpose WordPress theme with 12 unique layouts for you to use. The theme package includes 29 unique demo themes; you will be able to make your website look exactly like the ones on the theme demo, unless you are aiming for different results. Oshine is a highly customizable WordPress theme and you have access to over 500 different fonts, unlimited color variations, 12 different layout options, 50-page builder shortcode modules, and much more. Also, this theme supports many popular plugins such as WPML (multilingual WordPress setup), BuddyPress, WooCommerce, Gravity Forms and others. Oshine definitely has everything to create a beautiful and modern portfolio, photography or other creative websites. Divi is a powerful and flexible, customizable and extensively developed, wonderfully lightweight and mobile friendly, easy to use and intuitively structured, Retina-ready and SEO friendly responsive WordPress multiconcept, multipurpose theme. This visually stunning and remarkably well-rounded theme is crafted with the strength and pliability to seamlessly lend itself to a whole host of diverse website archetypes and applications across a vast range of industries and fields. The developers behind Divi extensively outfitted with a powerhouse set of tools, plugins, widgets and features, professionally composed in a series of sophisticated template pages and amazing layouts brimming with intense creativity and visual gravitas. These are readily modifiable to suit your precise specifications through the intuitive and in-house-developed Divi Builder, an award-winning visual page building tool based on content blocks that users could easily dragged and dropped, configured and customized with just a few clicks and absolutely no coding. Lastly, dozens of handsome Portfolio page templates and clever customization capabilities, as well as handsome visual styling choices, make this theme fantastic for portfolio websites of all kinds. Show off your work to the world, with Divi! In a nutshell, Werkstatt is a modern creative portfolio theme with a range of stunning layout options. It maintains a chic and minimalist look while offering endless possibilities for showcasing your images and designs. No less than fifteen portfolio templates, all benefitting from a drag-and-drop interface, make customization a cinch. And with 19 gorgeous one-click demos, all you have to do is add your content and you’re up and running. Every demo is created using Visual Composer, and each element can be moved from one to another with ease. With this kind of control, creating a truly unique site is no challenge. Werkstatt also has full WooCommerce support, should you want to sell your products or services from your website. The possibilities with this theme are practically endless. It offers numerous pre-built layouts and plenty of customization features to make them your own. If you want to add a blog section to your site you can select from seven pre-built styles. Finally, there are also over 3,000 fonts to ensure your text is as beautiful as your imagery. In conclusion, Werkstatt arguably has everything you need to create a uniquely impactful portfolio website, and is well worth your consideration. 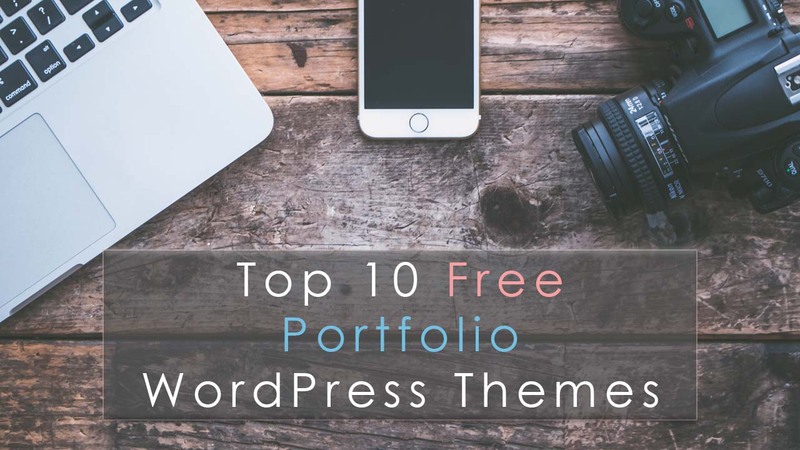 Portfolio Gallery is an advanced, modern and elegant WordPress theme for displaying images in different customizable layouts using various color schemes, font size, widgets, and features. It’s responsive, SE0- and user-friendly.The typography of the theme also provides broad options for customization. You can adjust the settings for the heading typography, primary and secondary fonts, and also for input and text areas. It allows you to choose the typography font, letter spacing, style, together with text-transform and weight options.